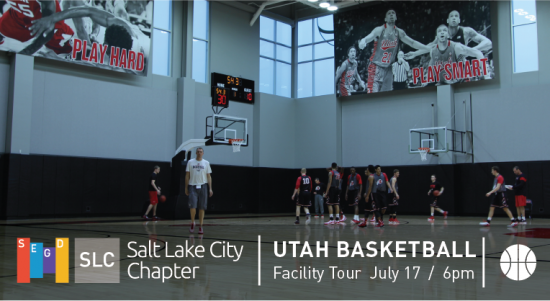 Join SEGD SLC and Infinite Scale in touring the Jon M. and Karen Huntsman Basketball Facility at the University of Utah. The state-of-the-art, $36 million, 101,000-square-foot structure, opened northeast of the Huntsman Center arena on Oct. 1, 2015. The four-story building features a legacy hall, separate glass-enclosed upper levels for both the men’s and women’s programs, and a rooftop terrace. Infinite Scale worked collaboratively with the coaches of both teams to develop a sophisticated and restrained branding program that integrated seamlessly into the designs of the architect, Populous, and interior designer, Elliot Workgroup. This is a tour you certainly will not want to miss. Space is limited, so please RSVP in advance, we will be checking tickets at the door.